Regular professional cleaning is important to maintaining your pet's teeth. We use modern and safe ultrasound technology to clean each tooth thoroughly - above and below the gum line. Dental technicians polish teeth to create a smooth, lustrous tooth surface more resistant to plaque buildup.Advanced dental care is available, including extractions. In any emergency, seconds count. Our experienced staff is prepared and the clinic is stocked and equipped to administer the ABCs of basic life support – Airway, Breathing, Circulation/Cardiac compressions. Emergency care is offered during regular business hours. In addition, we use the services of a local, fully staffed emergency facility. Our veterinarians cover all areas of medicine, including: Cardiology; Ophthalmology; Neurology; Dermatology; Gastroenterology; Orthopedic surgery; Oncology; Endocrinology; among others. We will also consult or refer cases to a specialist if indicated at any time. Pets are like our children – we feed, nurture and lavish attention on them. Our highly qualified kennel attendants do the same when you can't be there. We provide tender loving care, and supervised outdoor time to keep them happy and active. Some pets require special food, and all pets benefit from a balanced diet. Our trained staff is available to help you choose the right diet for your pet to keep him or her happy, healthy and active. Radiology – or X-rays – help our veterinarians evaluate muscular-skeletal, cardiovascular(cardiopulmonary), gastrointestinal, reproductive and urinary systems. We offer the most advanced surgical techniques and technology. All patients are carefully screened for safety, and anesthetics are specifically tailored to your pet. Surgical services and facilities include: board certified surgeon available for consultation; fully trained veterinary and technical staff, to ensure the safest, most efficient, state-of-the-art procedures for your pet; advanced sterilization techniques; ECG,BP, and oxygen saturation monitors; intensive after surgery care and full blood testing. This non-invasive, state-of-the-art technology uses sound waves to painlessly examine specific internal organs, primarily the heart and abdominal organs. Saying goodbye to a beloved pet and family member is painful. We work with clients to ensure their pet's comfort and dignity at all times. Services include taking care of the remains as directed by the client. As of 9/24/18 We will have a new groomer. We are scheduling now for her. The new groomer is Mariah, she has 14 years experience. Mariah and her family recently moved to the Triangle area from California. Treat your pet to a therapeutic bath. Our special, cleansing baths remove dirt, debris and that doggie pet odor – your pet will feel fresh and revitalized. If scratching is a problem, our medicated baths contain soothing agents that stop the itching. Services also include nail trim and ear cleaning. Some examples of Mariah's work are shown below. CROSSROADS VETERINARY HOSPITAL is a full-service veterinary medical facility, located in RALEIGH, NC . The professional and courteous staff at CROSSROADS VETERINARY HOSPITAL seeks to provide the best possible medical care, surgical care and dental care for their highly-valued patients. We are committed to promoting responsible pet ownership, preventative health care and health-related educational opportunities for our clients. 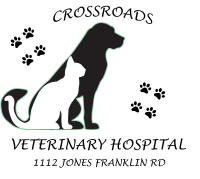 CROSSROADS VETERINARY HOSPITAL strives to offer excellence in veterinary care to RALEIGH, NC and surrounding areas. Please take a moment to contact us today, to learn more about our veterinary practice and to find out more information about how CROSSROADS VETERINARY HOSPITAL can serve the needs of you and your cherished pet.